Alan Knill believes the Sky Bet League Two monthly award nominations for manager Chris Wilder and attacker Nicky Adams are a ‘great boost’ for the whole Cobblers squad. Wilder and Adams have to wait until Friday to discover whether they have won the awards for manager of the month and player of the month respectively, but Town assistant boss Knill says the fact they have been nominated proves that in these troubled, off-field times, at least ‘ one part of the club is moving forward’. 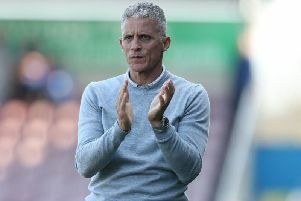 And he stated that, despite the doom, gloom and concern surrounding the club because of the financial situation at Sixfields, it is doubly important the players send the fans ‘home happy’ on match days – which is exactly what they are doing. “Whenever you read any news, it’s bad news,” admitted Knill. “It has been bad news over the past two or three months, and the nominations are a real boost for the squad. “Nicky’s performances have been brilliant, and he has been brilliant since he came to the club, he has been like a breath of fresh air. “What the team has done (claiming 13 points out of 18 in October), reflects on Chris as the manager, but I am sure he would say the nomination isn’t for him, because we are a team. “Whether that be manager, assistant, the players, it is a team. “It is good for the club as well because it shows that one part of the club is moving forward. “I am not going to say that is the most important thing, but it helps an awful lot. “When it comes to Saturday, and people come to the game, they might have been reading articles about how the club is in desperate trouble. The Cobblers are back in action on Saturday when they travel to Coventry City in the first round of the FA Cup.